Big news today about a free eBook that's perfect for children with food allergies, environmental allergies and/or asthma. 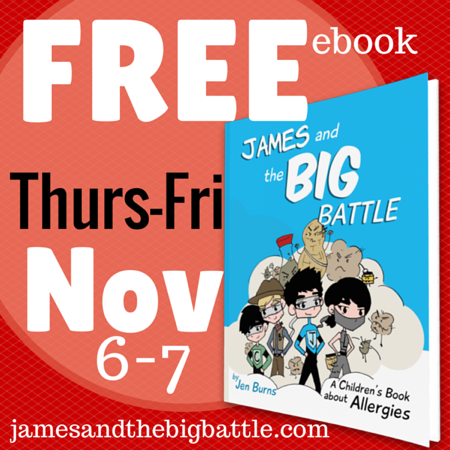 The author, Jen Burns, who has a son with allergies and asthma, contacted me with the great news that her book is free today and tomorrow, November 6 and 7. This book is a cute story about how James battles his allergies and asthma in an imaginary video game land. James has a team to help him and always carries his tools (epipens, inhaler, etc.). 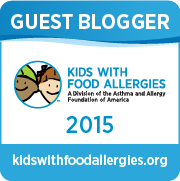 He faces his fears and learns how to live confidently with allergies and asthma. I love how this book is written in rhymes, and it keeps your attention with an exciting story as James moves through each land to battle his allergens. The book even includes fun free printable activity worksheets and coloring pages for your child.